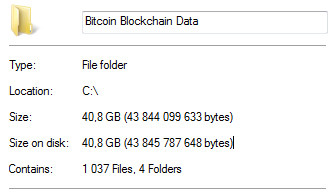 If you are using the Bitcoin Core wallet to store your Bitcoins locally on your computer you have probably noticed that the Blockchain data files have already passed the 40GB mark (about 40.8 GB at the moment). With the increasing number of transactions happening on the network the increase of the files will continue to grow constantly and this is another aspect that will cause issues for users. 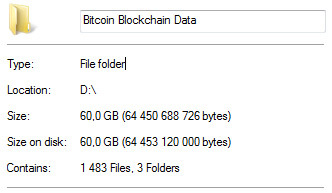 Apart from the serious file size there is another aspect, the time needed to synchronize the Blockchain data from scratch is quite big and it is not only dependent on the harddrive’s speed, but also on the CPU you’ve got to process all the data. If you are using the default data directory on your C drive you might be experiencing some free space issues, especially if you use a smaller SSD system drive. 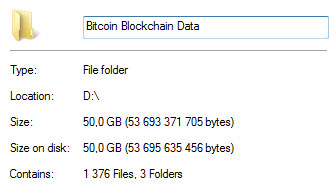 The solution for this would be to move the Blockchain data files to another drive and run the Bitcoin Core client with the datadir parameter pointing it to the drive an folder you have moved the data files. Alternatively you can go for a lighter version of a wallet that does not need all of the Blockchain data stored locally such as MultiBit or Electrum. And then there is also an alternative in the form of an online Bitcoin wallet, there are multiple options available to choose from such as Coinbase, Xapo and many others. Another interesting alternative for long term investments is to use your Bitcoins, or at least some of them, to buy Gold or Silver for example from a trusted precious metals dealer accepting BTC. Then there are also many other ways to invest Bitcoins, but you should be careful as there are quite a lot of scams out there promising very high and very fast returns on your investment, so you should be extra careful with such offers.